Bridge Clearance (incl antenna)47'-10"Headroom in Salon6'-0"Hull Speed6.5 knots. Optimum Heel Angle17 degreesSail Area-Tall Rig491 sfEngine-Universal Diesel26 hp3 cylinder, Water Cooled. Mainsail-Dacron with 2 Reefs, and Full BattensInternal Halyards. Internal Main Boom Topping LiftStainless Steel Standing Rigging Double SpreadersBoom Vang. Self Tailing Winch for Mainsheet and Main Halyard. Mid Boom Traveler Car Over Storm CoverSelf Tailing Winch for Jib Halyard. All Lines Led Aft to Cockpit for Solo Sailing. Genoa Tracks, Inboard, Port and Starboard. Pedestal Wheel Steering with Brake32" Destroyer Wheel with Stainless Steel Pedestal. Guard Emergency TillerEngine Controls and Compass on Pedestal Engine. Stainless Steel Handrails on Cabin Top Stern. Boarding PlatformStern Boarding Swing Ladder with Contour Treads. Lead Ballast Keel with Stainless Steel BoltsOne Piece Fiberglass Hull, WhiteOne Piece Fiberglas Deck, White with Gray Two Tone Molded-in Gel Coat. Waterline, Midwatch BlueMidwatch Blue and Silver Sheer Stripes Molded-in Non-Skid Surfaces Coaming Compartments, Port and StarboardCockpit Seat Locker and Lazzarette (2) LockersCushions for Cockpit (7)Propane Locker with Legal Bottle Recessed Anchor Locker on Foredeck.Anchor Roller on BowDouble Rail Bow PulpitStern Pulpit Double Rail with Observation SeatsHelm Seat with Cushion Stanchions and Double Lifelines. Teak Veneer Bulkheads and Teak Interior Trim Varnish Finish on Interior Folding Forward Cabin. Door Ventilation Deck Hatches in Main Cabin with Screens. Chart Table with Adjustable LightOpening Forward Hatch in Vee-Berth with Screen Opening Cabin Top Hatches in Salon with Screens (2)Privacy Curtain for Aft BerthBerths for 6Main Cabin Table with Folding LeafHanging Locker. Midship Galley with Stainless Steel SinkCustom Molded CountertopStove-Gimballed with Two Burners & Oven, Stainless Steel. Hot and Cold Pressure System with Outlets in Galley and Head. Shower in Head-Wet with Hot and Cold Water. Shower in Cockpit with Hot and Cold Water. Fresh Water Tanks (2) Total 43 GallonsHot Water Tank – 6 Gallons. Marine Head with Holding Tank-18 Gallons with Deck Discharge Outlet. Macerator Pump for Legal Overboard Discharge of Holding TankBilge Pump-Electric, AutomaticBilge Pump-Manual (Backup). ELECTRICAL SYSTEM:12 Volt Electrical Panel110 Volt Electrical. PanelFlorescent and Incandescent LightingBattery, House-Deep Cycle Marine (new)Battery, Engine Start-High Capacity Dockside Power, AC with Duplex OutletsS hore Power Cord-30 amp 115vNavigation LightsAnchor Light on MastheadDeck Light and Steaming Light on MastRack in Salon for Hatch Boards. 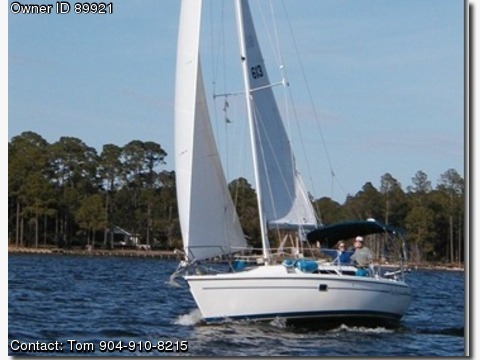 Foresail, Ullman-new 155%Hull will Be Bottom Painted March 2011.Mast Block Replacements-Ball BearingsAll filters(3), Oil, and Impeller Replaced March 2011Bimini, Short Shade Canopy including Side Screens to Cover Complete DeckPedestal. Guard, Offset-EdsonAdditional NavPod for Pedestal InstrumentationAutopilot-Raymarine ST4000+Wind, Depth, and Speed Autohelm ST50+Clinometer (Heel Indicator)GPS, Garmin III+Battery Charger-Marine (upgrade)Cockpit Cushions, Vinyl, White with Gray Piping (6)Cockpit Table, FoldingCanvas Package-Covers for Mainsail, Pedestal, & Winch (4) – BlueCompanionway Cover-CanvasHatch Canvas Covers (3)Anchors (2) CQR-25#, Danforth-22#. Divided Anchor Locker for Two Separate Rodes Fenders (6)Fender Boards (2)Mid-ship Cleats-AdjustableBoat Hook-Expandable to 144" with Rail MountLightning Protector on Mast Head-Bottle BrushOutboard Motor Mount on Stern RailHelm StoolLighting Pods Under Stern Pulpit Seats for DockingCustom cabinets in SalonAdditional Panel for Radios, Switches, and GaugesVHF Radio-Base ICOM ICm45 with Mast Head Antenna (Metz)Radio, AM/FM with CD-ROMTank Level GaugesAir Conditioning-Coolmate 5000BTURefrigeration-Adler Barbour Cold MachineWater Connection for Continuous Dock WaterWater Filter on Galley SinkShades for Salon Windows, PleatedUpgraded Upholstery in SalonRack in Salon for Books or TVFans (2) Oscillating 12vFan-Twin 120vAdditional 12v Outlets for Computers, etc.Screen on Forward HatchScreen on Salon Hatches (2)Screen for CompanionwayWine Rack in GalleySpice Rack in GalleyCustom Memory Foam Mattress and Cover.Call Tom 904-910-8215.